The current owner Selby Minner gives us a tour of the place originally opened by the grandmother of blues great D.C. Minner, Selby’s husband. A display on one wall holds pictures of the 71 inductees to the Hall of Fame over the past ten years. Although D.C. died in 2008, Selby has kept the hall of fame going as well as the annual Dusk till Dawn Festival which has been around for the past 23 years during Labor Day Weekend. Oklahoma blues musicians have played with legends like Count Basie, Duke Ellington, Louis Armstrong, Cab Calloway and Billie Holliday. And many Oklahomans have become legends themselves like Charlie Christian, Jimmy Rushing, Jimmy Liggins, Lowell Fulson, Roy Milton, Elvin Bishop, and Jimmy Nolen. So, why doesn’t Oklahoma Blues get the respect it deserves? Selby’s got a few theories. But, Larry O’Dell with the Oklahoma Historical Society says the mix of cultures makes Oklahoma Blues Special. In fact, Oklahoma City musician and band leader Hart Wand published the first blues song on Sheet music called “Dallas Blues”. At her home in Oklahoma City, Dorothy Ellis also known as Miss Blues plays a version of it on her computer. For 70 years Miss Blues has performed what she calls a style of music unique to America and Oklahoma. Miss Blues started singing the Blues when she was eight years old and has always believed is started in Oklahoma. She was inducted into the Hall of Fame in Rentiesville back in 2004. 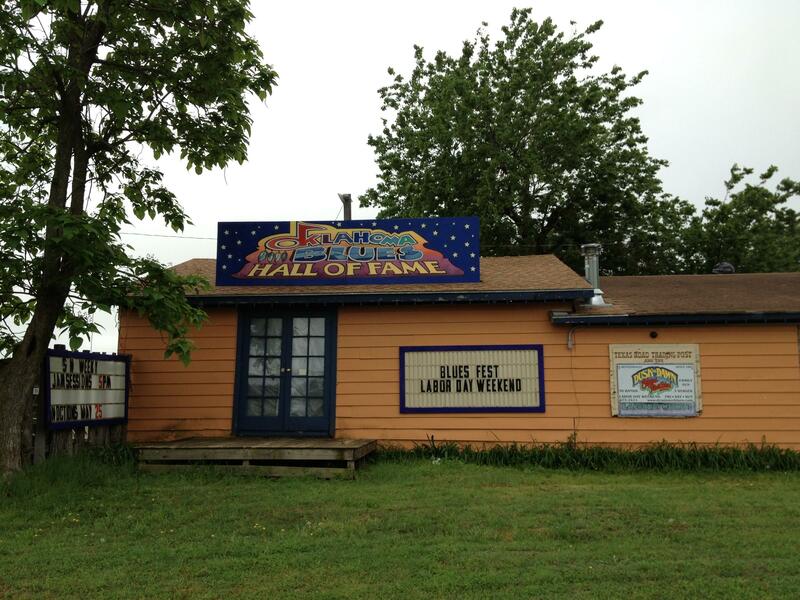 She says she loves the fact that the hall of fame is in an old drinking establishment. Another theory on why Oklahoma doesn’t get the respect it deserves for its contribution to Blues is a lack of an established music scene like Memphis. But a local group, Watermelon Slim and the Workers wants to change that. Norman resident and Bassist Cliff Belcher says the band recently returned from a festival in Finland and the last four albums have received worldwide attention. Watermelon Slim, Miss Blues and Selby Minner are all performing over the three day Labor Day Weekend Dusk till Dawn Festival in Rentiesville. Selby says it’s a family friendly event showcasing true Oklahoma Blues at its roots. Several other groups are working to bring Blues back at the end of August with the Mayor’s Blues Festival in Medicine Park and Arcadia’s Blues Festival. There’s also a free event on Blues culture in our state at the Oklahoma History Center on August 28th.